Chicago Blackhawks defenseman Michal Rozsival was given a penalty major penalty for interference and a game misconduct for this hit on Minnesota Wild forward Jason Zucker. Was this worthy of a game misconduct? Also, is this hit worthy of a suspension? I don't believe so. I suppose, this is what we will remember when it's all said and done. Boston Bruins forward Matt Beleskey's game-ending slash on Minnesota Wild forward Jason Zucker. When you watch it, the slash looks kind of innocuous. It doesn't look like much. I suppose Belesky caught Zucker in a nerve or something. Last night’s win against the Vancouver Canucks proved to be very costly. The Wild lost Jason Zucker and Ryan Carter to upper-body injuries. Both players were placed on injured reserve. Michael Russo, Startribune – The Wild lost Zucker and Carter to upper-body injuries in the first period. “We should not expect them back in the lineup in the near future,” coach Mike Yeo ominously said after the Wild’s sixth consecutive regulation win pulled the now 9th-place team (8-1-1 in its past 10 overall) within three points of a playoff spot and six points of Winnipeg heading into Tuesday’s game in northern Minnesota (Manitoba). I’m told Carter was in a sling after the game and personally it looked to me that Zucker also sustained a shoulder injury. The Wild’s 18-goal scorer (17 even-strength goals) got jolted pretty good chasing a loose puck along the wall by defenseman Luca Sbisa. A few minutes before, Carter crashed hard into the boards after being checked by defenseman Yannick Weber. The Wild had to use 10 forwards for 50-plus minutes tonight and did look like they started to get gassed late in the game. Jason Pominville credited coach Mike Yeo for helping navigate a convoluted bench as Yeo had to mix and match forward lines all night. Losing Jason Zucker could prove costly for the Wild. Zucker's 18 goals makes him the second leading goal scorer for the Minnesota Wild. LeBrun: All 700-plus NHL players are not here in the Olympics. What's always intrigued me is the idea of how rank-and-file players who never get to play in the Olympics really feel about shutting down the game for the Olympics and whether their input is heeded. Fehr: We do, we do [ask them]. It's no secret, there are three things that go on: There are players who play; there are players who, even if they're not playing, hope that in the future they will, or players who did in the past and think it's a good opportunity for current ones to have. The second thing is, guys like the time off; they like to see their families; they like to do that. And the third thing is, there's at least the opportunity for some nagging injuries to heal. That's not so bad. But to answer your question more directly, as far as the players' association is concerned, this decision will be made by all 720 to 750 players -- it's not made by a small group. 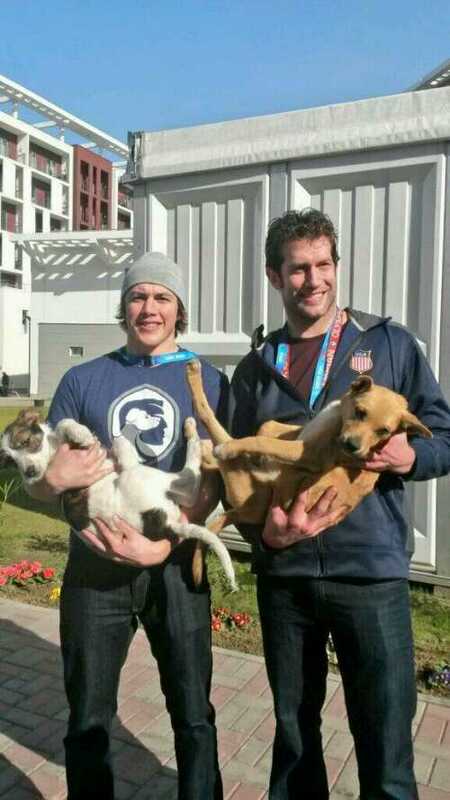 Apparently, David Backes and T.J. Oshie have adopted some stray dogs from Russia. Scott Burnside, ESPN.COM – He's an innocent victim of circumstances," added Dr. Mark Aubry, the IIHF's chief medical officer. "There is no doping in this instance." The trophy, awarded to the National Collegiate Hockey Conference regular-season champion, is making a tour of all the conference home sites. After North Dakota’s 6-2 victory over Minnesota Duluth tonight, it’s undoubtedly the last time that the trophy will show up in Duluth this season. It may find an out-of-season home in Grand Forks, N.D., however. According to Michael Russo, Wild winger Jason Zucker will miss the upcoming road trip to Edmonton and Vancouver. For the most part I thought that the Minnesota Wild were the better team today, except for the two-four minute period of time where the Minnesota Wild tried to sit on the lead and it came back to bite them in the back side. Zucker: "That crowd was unbelievable and you feed on that stuff." I applaud the NHL for making this ruling, this was unnecessary, unneeded and I don't care if Corey Perry said he was sorry after the game. Don't want to get suspended, don't make the hit. I think this suspension should be five games. I keep hearing the argument, but it's not a dirty hit. What do you mean, it's not a dirty hit, the puck is gone for more than two, if not three seconds, in this situation, Perry is trying to blow up Jason Zucker. Think about it this way, Perry took out a good player on a team that is in competition with them for a playoff spot in their division. Objectionable hits should have consequences and in this case it does. Corey Perry will sit for four games. NEW YORK -- Anaheim Ducks forward Corey Perry has been suspended for four games, without pay, for a late, illegal check to Minnesota Wild forward Jason Zucker during NHL Game No. 384 in Minnesota on Tuesday, March 12, the National Hockey League's Department of Player Safety announced today. Under the terms of the Collective Bargaining Agreement, and based on his average annual salary, Perry will forfeit $115,135.12. The money goes to the Players' Emergency Assistance Fund. The incident occurred at 4:21 of the second period. Perry was assessed a major penalty for interference and a game misconduct. Again there is no defending this hit. Although, I have seen a few try today. In my opinion this is a violation of rule 48 and will cost Anaheim Ducks forward Corey Perry a game or two from the department of players safety, if it doesn't I will be very surprised. In my opinion, Wild forward Jason Zucker is in a vulnerable position and the head looks to be targeted. Can you imagine how good Denver would be if Jason Zucker was still with the Denver Pioneers this season. According to Michael Russo of the Star and Tribune, this goal by Zucker tied an AHL record for one of the fastest goals in overtime (five seconds). This was a goal scorer's goal as well, the goalie never seen it coming. Former UND defenseman Chay Genoway was also on the ice for Aeros as well when the goal was scored. Jason Zucker to play right away for the Wild. Sounds like former DU Pioneer's star Jason Zucker is going to play for the Minnesota Wild Right away, as early has this Thursday. With Zucker signing a deal right away, this will cause Zucker to burn the first year of a three year deal. Russo's Rants --- Jason Zucker has signed with the Wild, a three-year entry-level deal, starting this season. He gets $70,000 signing bonus plus a prorated portion of a $700,000 salary these final 12 days of the season. He then gets $900,000 salaries each of the next two years if he plays in the NHL, which includes annual $90,000 signing bonuses. If the Wild gets through tonight healthy (to be determined with this squad), a roster move will have to be made tomorrow. Very good chance he makes his NHL debut Thursday vs. Florida as long as he passes his physical tomorrow. He has told the Wild he's healthy. Basically, the Wild's burning the first year of the deal, meaning he becomes a Group II and a Group III free agent one year earlier. The Wild had no problem with this. With unsigned Mikael Granlund and signed Brett Bulmer, Johan Larsson, Zucker, Zack Phillips and Charlie Coyle all turning pro and maybe signed defenseman Jonas Brodin, it could be problematic to have 7 guys up as restricted free agents in three years. This is the worst time of the year when fans of college hockey teams have to worry if they are going lose their favorite college hockey players. According to Chris Botta, who is a writer for the New York Times and the New York Islanders had this to say about Fighting Sioux forward Brock Nelson on his twitter feed. This past week, DU lost blue chippers Jason Zucker and Drew Shore in a matter of couple of days. So you never know what will happen and fans always seem to worry up until the puck drops in October. 8 Dan Senkbeil–13 Connor Gaarder– No forward. MADISON, Wis. – University of North Dakota center iceman Corban Knight, who led his team with three goals and four points in a victory and tie against visiting conference rival Michigan Tech last weekend, has been named the Red Baron® WCHA Offensive Player of the Week for February 21. A junior from High River, Alberta, Knight also won more than 62% of his face-offs in the two-game series in addition to his four scoring points and played a key role on UND’s penalty-killing units that blanked the Huskies on all six weekend power-play chances. He scored two goals, including a third period insurance goal with 1:37 remaining, drew an assist on teammate Carter Rowney’s game-winning second period tally, earned a +2 plus/minus rating and was the No. 2 star of the game last Friday (February 17) night as North Dakota won 4-2 over MTU. Knight then came back last Saturday (February 18) to score his team’s only goal in a 1-1 (ot) tie against Michigan Tech, giving his club a 1-0 lead with his power-play marker at 6:04 of the third period, earning No. 3 star of the game honors in the process. In 28 games played so far this season, Knight ranks third in scoring among UND players with 30 points on 11 goals and 19 assists. He is a draftee of the National Hockey League’s Florida Panthers. Also nominated: Jaden Schwartz, F, CC; Jason Zucker, F, DU; Erik Haula, F, UM. Check out Lou Nanne's comments at the 33:15 mark of the podcast. Lou Nanne had this to say on the Kyle Rau’s hit on Jason Zucker. “The one penalty that I thought was out of whack was the one that they kept Rau out of the game Saturday. I think the referees did that because they probably felt that Zucker wasn’t going to play, which he didn’t that next night, and they were just trying to even things out,” Nanne Said. Barreiro asked Nanne if he felt the Rau hit was worthy of a one game suspension. Lucia, "referees made the right call"
Image via WikipediaThis was on Roman Augustoviz blog today. Lucia said he felt the referees made the right call when they gave Kyle Rau a major penalty for boarding and a game misconduct for his hit on Denver forward Jason Zucker in Friday's game. WCHA commissioner Bruce McLeod called Lucia that night, the Gophers coach said, to tell him the league was going to review the play. He watched it on video that night after not seeing it live. The next morning Lucia said he talked to McLeod again and was told Rau would probably be suspended. "At that time, we had the right to appeal the suspension, which would have allowed Kyle the right to play Saturday night," Lucia said. "But 99.9 [percent of the time] we probably would have lost the appeal and he would not have been allowed to play the next Friday night against Bemidji." Lucia decided the best option was not to appeal, so he could prepare his lines better for the Beavers. He said the difficult part of the situation was the supplemental discipline. "There were a couple of other major penalties on the weekend," Lucia said. "You can go back to incidents -- what deserves extra and what doesn't?" After seeing the video of the Kyle Rau hit on Jason Zucker, it's good to see coach Lucia support the league decision on that Rau hit. Lucia does also make a good point, "You can go back to incidents -- what deserves extra and what doesn't?” I think that’s the question a lot of the fans are wondering as well. Here's a video of Big Ben Blood taking out Jason Zucker with a textbook body check. Ben Blood is leading the country in plus minus. His 36 is far better than the next guy on the list, Notre Dame's Sean Lorenz who is at 29. Matt Frattin is #3 at 28. Blood has been a rock for us on defense, but he hasn't gotten the national attention that he's deserved.